With a world in crisis, its heroes reach out to find companions, to take stock for the struggle ahead, and to look beneath the surface at clues that may make the difference between a person’s fame and a nation’s doom. On the fringe of the cursed Percentalion, Treaman’s adventuring band revives the glory-days of Trainertown, celebrated by all—except themselves—as the hand of destiny. Somewhere in the remote Marble Swords, Sir Renan abandons name and fortune to seek a brotherhood that no one else believes exists. Near the forests north of Shilar, Prince Gareth wrestles with the choice to preserve his honor alone, or rejoin his royal father’s house and in so doing, cause a war between the children of Hope. Now at the heart of Conar—safest city in the Lands—Solemn Judgement, the Man in Grey, uncovers the gateway to peril; he is thrown among adventurers that include his only friend, the woman who refused to teach him, and a man who has vowed his death, in… Reunion of Souls. One thing that greatly impressed me at the start of the Age of Adventure in the Lands of Hope is how painfully young some of the main figures were when they were drawn into danger. Trekelny, the great Stealthic who opened the change in eras around 1992 ADR, was about eighteen at the time and was already something of a legend by 1995 (the date most sages officially use for the end of the Age of Peace). Treaman the Woodsman played a pivotal role in breaking the Percentalion’s curse, and was nineteen in that year. As prince of Shilar, Gareth was just seventeen yet found himself thrust into the midst of tense negotiations between his nation and the nomadic Bordbeyonds across the River Sweeping. And the main character of the epic Judgement’s Tale, Solemn Judgement was probably just fifteen on his landing (his friends declared the night of the 10th of the Tenth month to be his sixteenth birthday, just before he faced off against the liche Wolga Vrule for the first time). Much of the fate of the Lands rests on the shoulders of those who are hardly adults by our standards today. But most of what we know about this period of history comes from the hand of a scribe younger than all of them: Anteris of Trainertown, who begins to pen the Kingdom Chronicle in 1995 and 1996, was only fourteen years old when the tale began. Yet while Trekelny possesses superlative skill, and Treaman guides a party of adventurers who can protect each other, and even Judgement has his intelligence, resolve and untapped power to call on when needed… Anteris is just the scribe’s apprentice, a youth who dreams of adventure without knowing the reality. Anteris is a quick study and loves his chores as a scribe’s assistant; Valenthur his master and guardian notes how deftly Anteris can set type, the first instance of “telling a tale backwards”. As on the printed page, so it is for the history of the Lands, Valenthur notes; one must see the entire year first to be sure, then go back to the start and explain what happened. Anteris remembers this in later days, as confused and chaotic events emanate from the Percentalion south of Trainertown where he lives. When work is through, Anteris loves to run through town to the south gate, where with other children he watches until sunset for any sign of a returning adventurer from the chaos-lands, meanwhile drinking in tales of adventure from a few older veterans. Valenthur frets about his acolyte’s love of heroic deeds, but indulges him out of admiration for his hard work and obedience during work hours. Valenthur writes a pretty dry history, truth be told—things pick up when Anteris takes over the entries late in 1995 (as detailed at the start of The Eye of Kog). Beyond his youthful outlook, Anteris’ style carries a certain authority, though where he could have gained it is not immediately clear. But we are to understand that by early 1996, Anteris at just fourteen years of age is operating the presses and continuing to produce the Kingdom Chronicle, at least for the interim. Outside of work, Anteris is very fleet of foot, regularly winning the nightly race of apprentices to the south gate. He’s nimble as are many youths his age; they use a form of parkour—taking advantage of existing objects to accelerate and elevate one’s course usually through a man-made environment. Trainertown, once a city of nearly thirty thousand persons, is less than half that size in the present day: empty houses and streets are fair game for running youths to grab poles, rails, sills and more in a mad dash to wherever they need to go. Anteris uses these abilities to help win the races, and they will prove to be life-skills before all is said and done. His good friend Forge, the smith’s apprentice, is not as fast but even more acrobatic, with especially accurate aim and an openly fearless attitude. Whereas Forge is competitive and brave, Anteris is more a deliberate thinker. He speaks with the imposing itinerant preacher Alaetar on many occasions, learning about astrology and the heroic tales, things his master Valenthur is still reluctant to let him focus on. Anteris is one of the very few people who can see a new star in the heavens, red and menacing, and he keeps this knowledge to himself as he ponders its meaning. He knows a little of the Ancient tongue, so hard to speak and translate, and tries to help Treaman decipher a riddle in the ancient map his party found, without apparent success. Chiefly it seems that Anteris is a witness to part of history, which suits him to write about it later. He’s right in the front row, in part four of Judgement’s Tale, Clash of Wills, to hear the tangled, horrifying story of Canith and Piree, refugees from the Percentalion. He gets their account in garbled, backwards order as they relay the things which happened most recently first to the attending crowd. But to Anteris, this seems to make sense; like all of us his own experiences come first, while news of others’ deeds will come to his ears later, as he ponders what to write in the chronicle. And I feel confident as the epic tale continues to unfold, that this bright young lad will unravel many such mysteries, setting them in proper order once he’s experienced them in reverse the first time. Maybe it will help us, to do the same in our own lives. Will Hahn is the chronicler of the Lands of Hopetales. Will Hahn has been in love with heroic tales since age four, when his father read him the Lays of Ancient Rome and the Tales of King Arthur. He taught Ancient-Medieval History for years, but the line between this world and others has always been thin; the far reaches of fantasy, like the distant past, still bring him face to face with people like us, who have choices to make. Will didn't always make the right choices when he was young. Any stick or vaguely-sticklike object became a sword in his hands, to the great dismay of his five sisters. Everyone survived, in part by virtue of a rule forbidding him from handling umbrellas, ski poles, curtain rods and more. Will has written about the Lands of Hope since his college days (which by now are also part of ancient history). 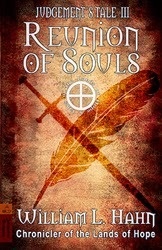 His current epic is Judgement’s Tale; parts one and two, Games of Chance and Strength of Conviction came out in 2014 and part three, Reunion of Souls is available starting December 26th. 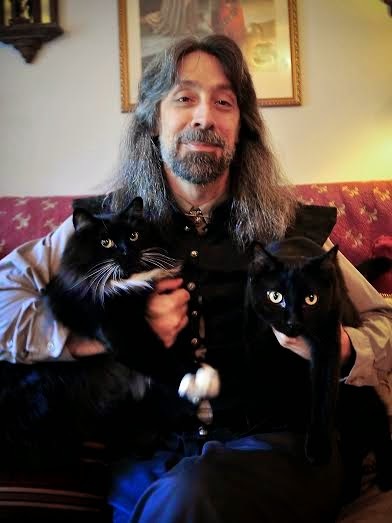 Will’s Weirdly Whimsical Website is where he posts news about upcoming releases and blogs about writing, classic fantasy works you’ve never read and the unique photo-based series “It Figures”. The Lands of Hope Facebook page contains a chronology of the Lands. The Plane of Dreams- A band of adventuring companions finds their greatest challenge comes when the quest has ended. See the trailer! Three Minutes to Midnight- If Trekelny is to steal the temple's greatest treasure, he must take the love of its High Priestess with him. A brief tale of the early days. The Book of Tales- A short illustrated tome of legends from the distant past of the Lands, featuring magical beasts and heroes. The Compendium of the Lands and the Maps of Hopeare freely available at his site. The Lands of Hope Facebook Page has a chronology of events in the Lands. For some reason, the post showed up in a black background. I just highlighted it inorder to read it. Yes. I'm thinking I'll try these books. Thanks Mildred! Looks like Heidi jumped on that and swapped back to white background. Thanks Heidi!